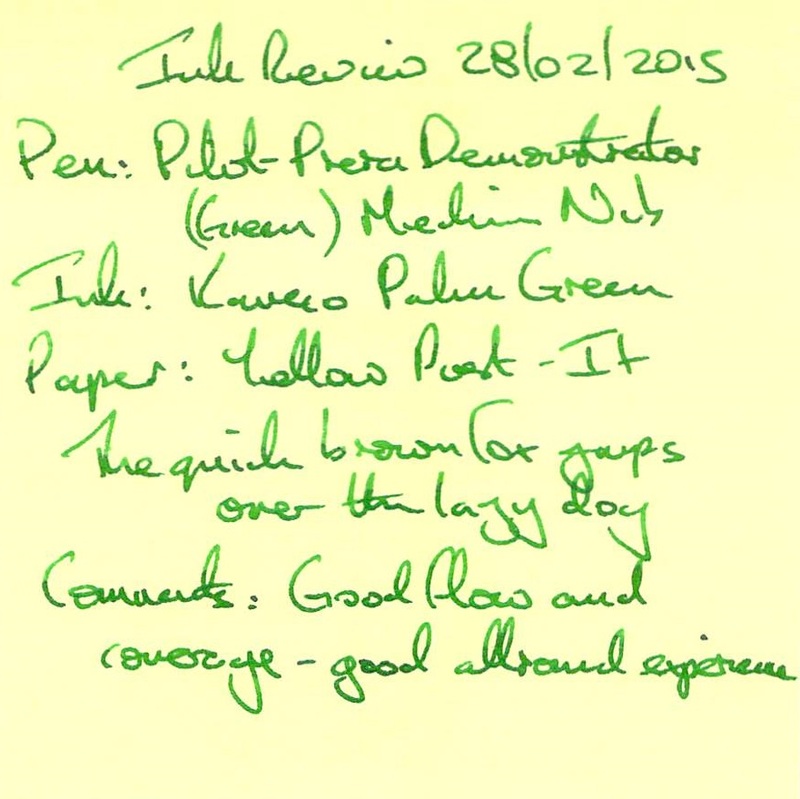 The fifth in this batch of ink reviews is for Kaweco Palm Green. 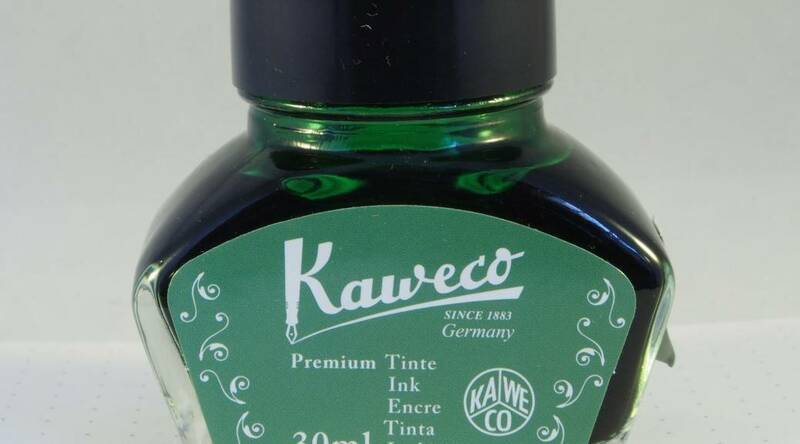 This ink was supplied free of charge by Kaweco. 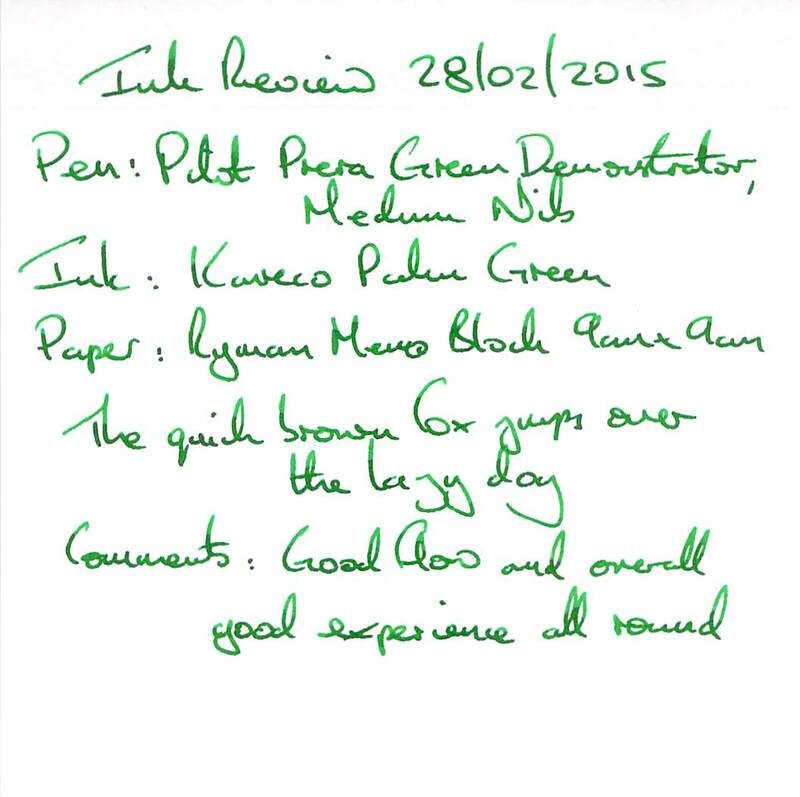 I was not paid to write the review, which is my honest assessment of the ink, and is not influenced by the fact it was supplied free of charge. All the comments that I made regarding the bottle, box and cost of the ink in my Kaweco Pearl Black Ink Review apply to this case too, so I shall not repeat them here. 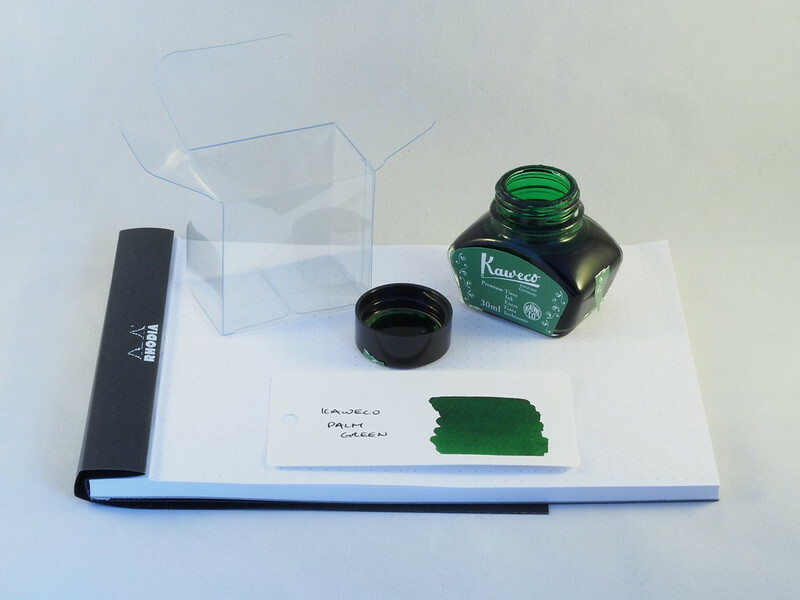 The only difference in this case is that the front and top labels have white text on green, matching the colour of the ink. The test pen in this case was a Pilot Prera Green Demonstrator with a medium nib. 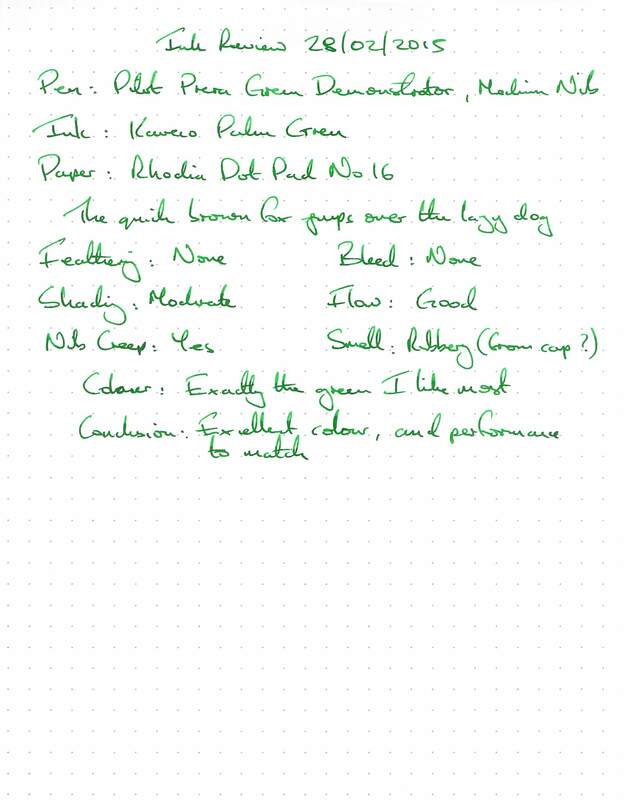 Water resistance was almost nil – no traces of lines were left after holding a writing sample under running water, and text was obliterated by water drops. Cleaning was very easy, presumably a result of the low water resistance of the ink. The drying time was okay at around 30 seconds. A good experience on this paper. Good performance on this paper too. 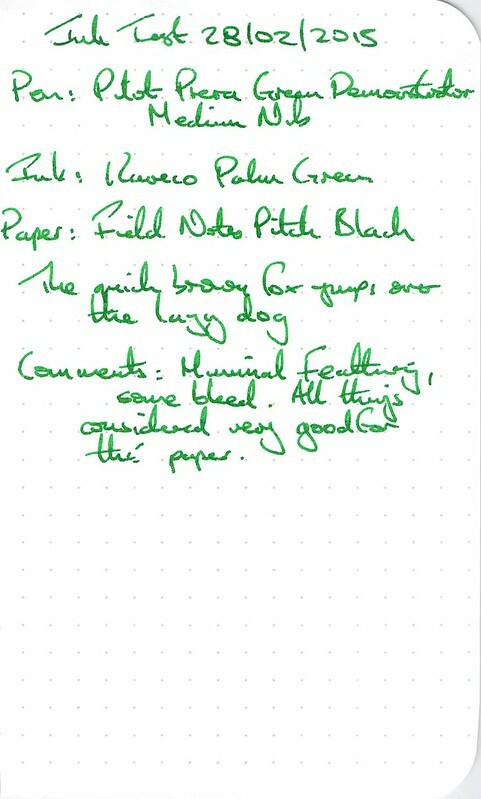 Even decent results on the Field Notes Paper. 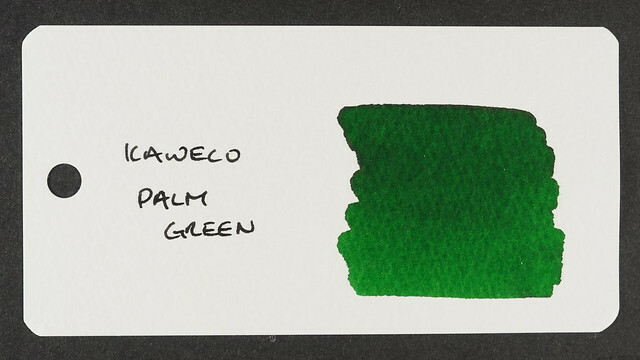 A good representation of the ink and the texture shows some of the possible shading. 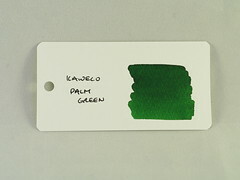 In writing this review I wasn’t really sure what “Palm Green” was meant to look like, so I resorted to Google. None of the images came that close to this colour – most leaned towards grey (actually closer to the label), and a few were a lot darker. I appreciate the problem that Kaweco had when naming this ink, as it’s neither too blue or too yellow, so I suppose it is mid green and while “Palm Green” may not be the best name, short of just calling it “Green” I can’t think of anything better. 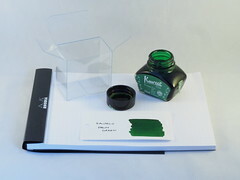 The colour itself is exactly the kind of green that I like, so this one will come into use as soon as possible. The performance is very good too so it should be suitable for markup on most papers. 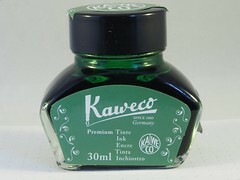 Once again, if you like the colour and are okay with the cost, this ink will not disappoint.